Store Hours: Monday – Wednesday: 9 a.m. – 7 p.m. | Thursday – Friday: 9 a.m. – 8 p.m. | Saturday : 10 a.m. – 7 p.m. Sundays: 10 a.m. – 7 p.m. Sing and Dance with Esther Crow! Bilingual Story Time with Jorge Luján! When Walter jumps on his bed, it crashes through the floor with hilarious consequences. Colorful graphite and Photoshop, cartoon-like illustrations (3-7). In celebration of twenty-five gleeful years in print, Tedd Arnold has created all-new artwork in the zany style he is now known and loved for - the style of his other bestsellers Hi! Fly Guy and Parts. 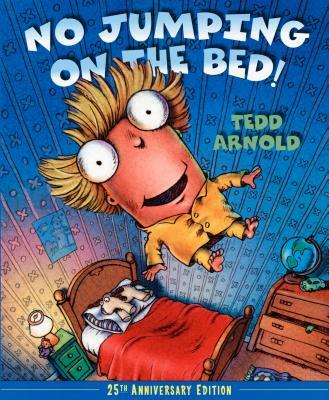 Tedd Arnold (www.teddarnoldbooks.com) lives in Elmira, New York. He is a two-time Theodor Seuss Geisel Honor winner and an Edgar Award winner, among other honors, and his No Jumping on the Bed! was named an IRA-CBC Children's Choice book. Store Hours: Monday – Wednesday: 9 a.m. – 7 p.m. | Thursday – Friday: 9 a.m. – 8 p.m. | Saturday – Sunday: 10 a.m. – 7 p.m.